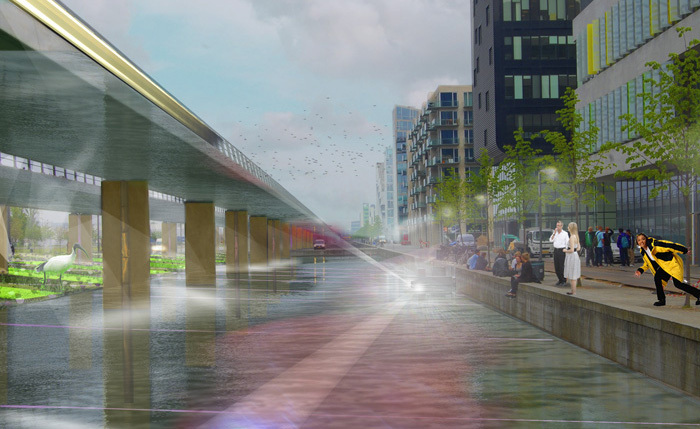 The proposal orchestrates existing qualities of the site: A hard urban space with a high speed and an infinite view along tall houses and an elevated railway. Something you are to find in New York or other big cities but rare in Denmark. These qualities is preserved and strengthened. But the monotonous, high speed is also confronted with local qualities and breaks. 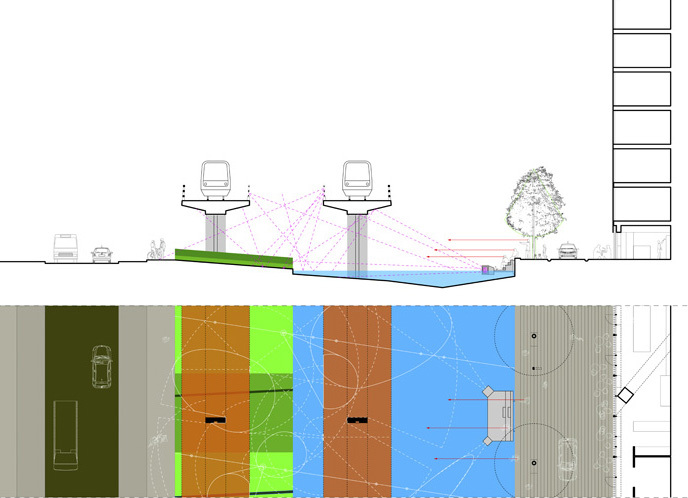 The project proposes new breaks with different distances compared to the ones of the massive columns. New and old breaks glide past each other creating a moiré pattern where different repetitive rhythms together form local constellations. THE SCENE: On the sloping grass surface plantations, lights, reflectors are arranged in fields that are alternately either flat or low. Flat fields can basically be grass, while low fields can be robust cover types as boxwood. The fields crossed by lines that may be hedges, which grows a little higher. Here experiments can be made with flowers, such as tulips in the spring or on the other hand metal surfaces, cut into silhouettes or perforated, as the building "The Mountain". THE MIRROR: The water is a fluctuating and changeable surface for play of light. From here color and light is reflected up at the ceiling. During the summer there may be smaller elements flowing at the surface. Here is proposed small rafts with projectors in the corners where people moving out of the raft, can play with the movements of the light. THE CEILING: Lights, reflections and shadows are gathered underneath the elevated railway. Along the inside of the two metro tracks lights are attached. From the western track light is transmitted over the water while the light from the eastern trail lightens the scene and are also transmitted out on the pavement and road outside. The backlit which this creates will weaken the ability of the passers-by to look in to the site. This will create confidence within the site to stand in front and look at the light and not to be exposed to it. Lines that cross through both the mirror and the scene indicate where there can be lights and reflectors. Attractions created by the project should create the occasion for the pedestrians to seep into the street of the project-site. Initially turn their eyes, then slow down and subsequent settle down. Differential movements, local minor scales, tempo and pauses. All of this shall create the possibility for situations and events to occur. It is as fleeting and transient, but essential melodies that arise across the sites' new swinging rhythms based on the hard, but effective "techno beat" you already find on the spot. Transverse lines contrast the long flat surfaces. But the "long" view is maintained and are not obstructed by visual barriers. The proposal is a robust strategy for a score for site development. Here it is illustrated with a proposal focusing on light and shade, but it can be supplemented with or replaced with other parts. The simple strategy of the project allows many different interests and parties to contribute and to be heard by during a realization of the project. Here parts and effects can be allocated around by using the score.